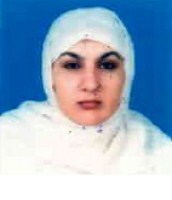 Mrs Naghma Mushtaq wife of Malik Mushtaq Ahmad was born in 1968. She served as Member, Provincial Assembly of the Punjab during 2008-10. She has returned to the Punjab Assembly in general elections 2018 for the second consecutive term. She has served as Minister for Zakat & Ushr from 2016-18. She also functioned as Parliamentary Secretary for Population Welfare during 2013-16. Basti Mianpur Belay Wala, Tehsil Jalalpur, Pirwala, District Multan.